I’m a big believer in taking the little roads, and I mean the Little Roads whenever possible. These are called ‘Class D’ roads in Germany. Class ‘A’ roads are the Autobahn. Class ‘B’ roads are state highways. On to the more interesting, ‘D’ roads are the little paved former footpaths which connected the villages. These are the roads where the heart of Germany still beats strong. Our guests can truly get to see Germany and the rest of Europe when we take these longcuts to our destination. OK, it takes longer to get from point ‘A’ to point ‘B’ but really, what’s the hurry? 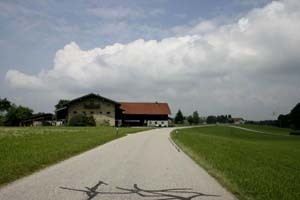 The road above is in the section of Bavaria just south of Landshut.